Since I had ventured into my culinary skills, I had been enjoying making a lot of food, baking and cooking. It is therapeutic in some way to me. I love it especially when I can make food for my loved ones to enjoy. I love the feeling that I felt when I see them enjoying what I had made. I love it even more when they appreciate it; they pat me on the back and praise me (although it might not have been that good). It is just the sense of euphoria, exaggerate I might seem, but I’m not. Therefore, I came up with an ingenious plan to extend out my love to my dearest oldest longest group of friends that I have. I made a pact to bake each of them a cake for their birthday this year. It might seem like nothing, but the fact that my group of friends consists of 10 people and of high tastes I might say, seem pretty daunting. But nevertheless, it will certainly be a joy to me to make and customize a special and unique cake for each of them. We called ourselves the 1984, which is the year we were born in. The name was stuck with us since high school and it never seems to fade away. We always say 1984 this, 1984 that, 1984 always, 1984 spirit and 1984 bond, you get the idea. They had been with me through thick and thin since 8 years ago, some even longer, and the stories about them could fill a book, a thick one for that matter. I would write about them if ever I have the time. Well a friend S just had her birthday in January during Chinese New Year. The time was packed but I managed to make a cake for her, at my nanny’s place. I’ve been lucky to have her kitchen to use, as my Taiping house’s kitchen is such a sad place, you could not even find salt there! Cooking at my nanny had been really eye opening, more about that next time. 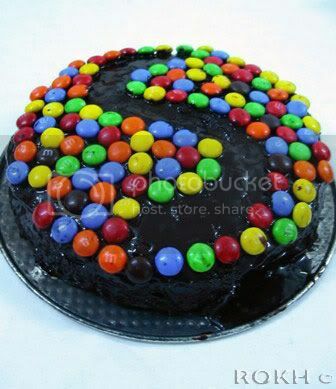 I had asked S before hand what type of cake she would want and her reply was really creative and challenging, she said “Colorful”. Wow, a great theme, it got me thinking. I consulted some of the other 1984s, and a friend inspired me. Finally, I made a simple chocolate cake with dark gooey chocolate frosting; and where are the colors you might ask? Well, take a look!